This dish is comfort food lightened up. 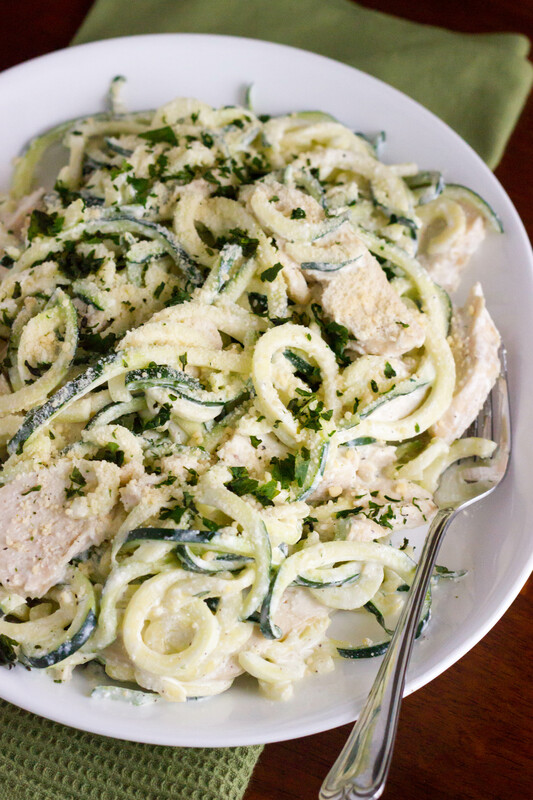 I’m obsessed with zoodles! They save you a ton of calories (compared to pasta), but I also love the light, fresh taste you get from zoodles. 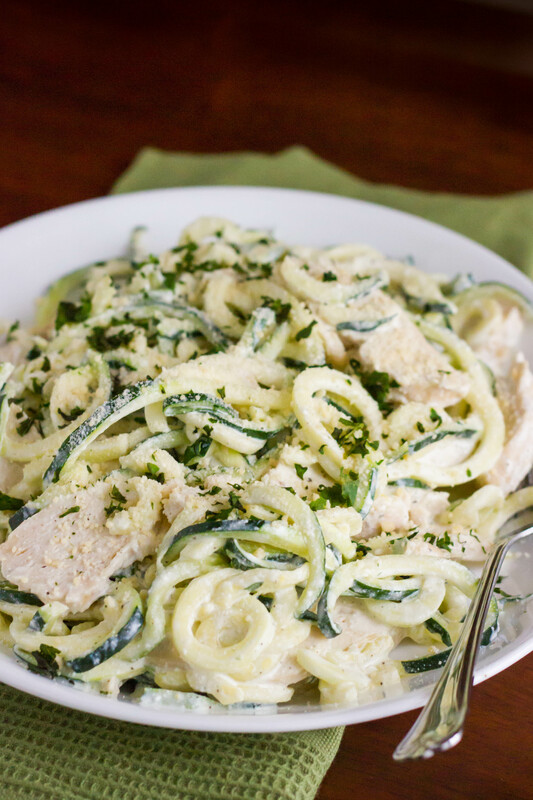 And you feel so much better after you eat a big plate of veggies (aka zoodles) rather than a big plate of pasta! Am I right?? 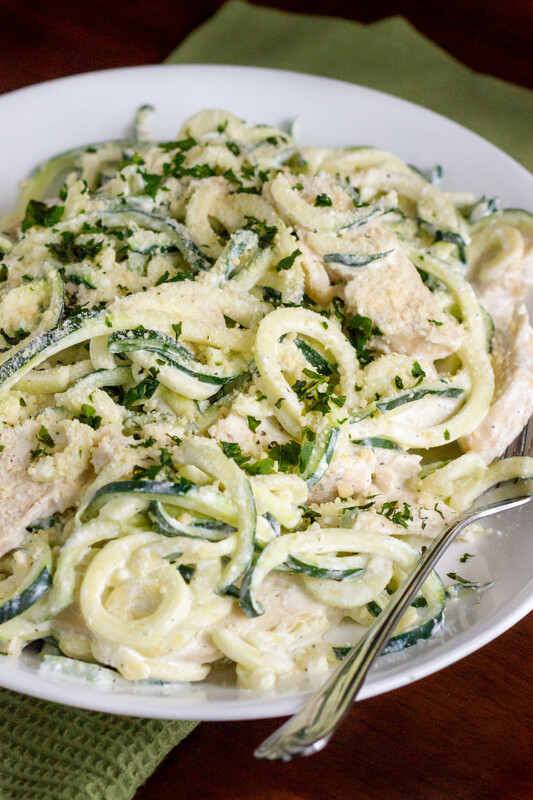 The zoodles pair perfectly with my ridiculously easy and guilt-free lemon cream sauce, using reduced fat cream cheese and ricotta cheese rather than heavy cream. It does not taste light at all! #winning I topped mine with some leftover grilled chicken, but shrimp would be great too. Use whatever you have on hand. Enjoy! 1. In large nonstick skillet over medium-low heat, combine neufchatel cheese, ricotta, garlic powder, lemon zest, and lemon juice. Stir until melted. 2. Increase heat to medium high and add zoodles. Cook until zoodles are heated through, about 3-4 minutes. (Don’t overcook or the zoodles will release too much water into your sauce.) Season generously with salt and pepper. Top with grilled chicken, parmesan cheese, and chopped basil. Serves 2. Nutritional Info (per 1/2 recipe): 314 calories; 15.1 g fat; 12.4 g carbohydrates; 2.8 g fiber; 35.2 g protein. Please sign me up to receive your emails. Thanks!